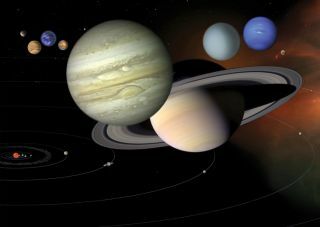 Our solar system is a vast place, with lots of mostly empty space between planets. But out there are comets, asteroids and more rocky, frozen objects (including dwarf planets) yet to be discovered in the Kuiper Belt and Oort Cloud. NASA's Spirit rover landed on Mars nine years ago today (Jan. 3), kicking off a surface mission that's still operational thanks to the amazing endurance of Spirit's twin Opportunity. Mars is currently host to five active space missions, commanding more attention than any planet apart from Earth. But unmanned probes are also exploring many other solar system bodies, from the sun out to Pluto and beyond. Solar and Heliospheric Observatory: SOHO, a joint effort between the European Space Agency (ESA) and NASA, launched in December 1995 and also orbits around sun-Earth L1. In addition to its sun-studying duties, SOHO has discovered more than 2,300 comets. The total mission cost is about 1 billion euros ($1.32 billion at current exchange rates). Advanced Composition Explorer (ACE): This $107 million NASA spacecraft launched in August 1997 to help researchers better understand and predict space space weather. ACE also orbits sun-Earth L1. Solar Terrestrial Relations Observatory: NASA's $550 million sun-studying STEREO mission, which blasted off in October 2006, consists of two spacecraft, known as A and B. Both probes are in a heliocentric orbit, with A zipping around the sun faster than Earth and B lagging somewhat behind. Messenger: NASA's $446 million Messenger mission (short for Mercury Surface, Space Environment, Geochemistry and Ranging) launched in August 2004 and arrived in orbit around the solar system's innermost planet in March 2011. Messenger has found solid evidence of water ice and carbon-containing organic compounds in the permanentaly shadowed craters near Mercury's poles. Venus Express: This $290 million ESA spacecraft blasted off in November 2005 and began orbiting Earth's hellishly hot "sister planet" in April 2006. Its main goal is to help scientists better understand the evolution of Venus' thick atmosphere. Akatsuki: The $300 million Akatsuki mission, which launched in May 2010, was Japan's second attempt to send a probe to another planet, after 2003's ill-fated Nozomi mission to Mars. Akatsuki has had troubles as well, failing to insert into Venus orbit as planned in December 2010. The probe is now circling the sun, and mission managers plan to take another shot at Venus in November 2015. Lunar Reconnaissance Orbiter: LRO launched on June 18, 2009, and arrived in lunar orbit five days later. The $504 million, car-size NASA spacecraft is studying the lunar surface for scientific and exploration purposes; its observations should help researchers decide where to put a future human colony on the moon, NASA officials say. This graphic from the China Lunar Exploration Program shows the progress of China's Chang'e 2 moon probe from its lunar orbit out to the L2 Lagrange point 1.5 million km from Earth. Chang'e 2: This well-traveled Chinese spacecraft launched in October 2010 to scout out locations for a future lunar lander, which China is readying for launch in 2013. After completing its mission at the moon in June 2011, Chang'e 2 headed out to sun-Earth Lagrange point 2 to help test China's deep-space tracking and control network. Then, in mid-April of this year, it departed to do a flyby of the near-Earth asteroid Toutatis, accomplishing the feat on Dec. 13. Several other spacecraft are also parked at sun-Earth L2, including the European Space Agency's Herschel and Planck space observatories. NASA's prolific Spitzer Space Telescope, meanwhile, is in an Earth-trailing orbit around the sun, and the agency's Deep Impact probe is headed toward a possible 2020 rendezvous with a near-Earth asteroid called 2002 GT. Deep Impact launched in January 2005 and slammed an impactor into Comet Tempel 1 on July 4 of that year. In November 2010, it accomplished a flyby of Comet Hartley 2. Deep Impact has traveled more than 4.2 billion miles (6.75 billion km) in space thus far. Mars Odyssey: This venerable NASA orbiter launched in April 2001 and arrived at the Red Planet six months later to look for signs of past and present water activity. The $297 million spacecraft also serves as a communications relay between NASA's Mars rovers and their controllers on Earth. Mars Express: This 150 million-euro ($198 million) ESA probe's main objective is to look for subsurface water from orbit. It launched in June 2003 and arrived at Mars in December of that year. Mars Express also aimed to put a lander, called Beagle 2, on the Martian surface, but this aspect of the mission failed. Mars Reconnaissance Orbiter: NASA's $720 million MRO spacecraft launched in August 2005 and achieved Mars orbit in March 2006. Since then, it has been mapping the Red Planet's surface with unprecedented precision. In addition to their scientific value, MRO's observations have helped NASA decide where to land surface missions on the Red Planet. MRO is also the chief communications link between Mars surface craft and Earth. During its 84 and 85 day (sol) on Mars, Curiosity snapped this newest mosaic self-portrait. Opportunity Rover: This golf-cart-size robot launched in July 2003 and landed in January 2004, three weeks after its twin, Spirit. Spirit and Opportunity were tasked with three-month missions to search for signs of past water activity on Mars; both found plenty of such evidence and kept on roving. Spirit stopped communicating with Earth in March 2010, but Opportunity is still going strong. NASA has spent about $900 million on the rovers' mission to date. Dawn: NASA's $466 million Dawn spacecraft launched in September 2007 and arrived at the protoplanet Vesta — the second-largest denizen of the main asteroid belt between Mars and Jupiter — in July 2011. Dawn departed Vesta in September 2012 to head to the belt's biggest body, Ceres. It should reach the dwarf planet in February 2015. Rosetta: This ambitious ESA mission, which costs about 1 billion euros ($1.32 billion), aims to orbit and drop a lander on the comet 67P Churyumov-Gerasimenko. Rosetta launched in March 2004, executed flybys of two different asteroids in 2008 and 2010 and is set to meet up with the comet in mid-2014 near the orbit of Jupiter, about 420 million miles (675 million km) from Earth. Juno: This $1.1 billion NASA spacecraft launched in August 2011 and is slated to arrive at Jupiter in August 2016. Over the course of one Earth year, Juno will study the gas giant's atmosphere, internal structure and magnetic field from orbit. Juno is the first solar-powered spacecraft ever to venture as far as Jupiter. NASA's Cassini spacecraft captured this image of Saturn on Oct. 17, 2012, while in the planet's shadow. Cassini's cameras were turned toward Saturn and the sun so that the planet and rings are backlit. Cassini: The $3.2 billion Cassini-Huygens mission, a joint effort involving NASA, ESA, and the Italian Space Agency, launched in October 1997 and achieved Saturn orbit in July 2004. The Cassini spacecraft has been studying Saturn, its rings and the planet's many moons ever since. In January 2005, the probe also delivered the Huygens lander to the surface of Titan, Saturn's largest moon. New Horizons: This super-speedy NASA spacecraft launched in January 2006 and is set to fly by the Pluto system in July 2015, giving researchers their first-ever up-close look at the dwarf planet. After that, the $700 million probe may also fly by one or more objects in the Kuiper Belt, the ring of icy bodies beyond Neptune's orbit. Voyager 1 and 2: NASA's twin Voyager probes launched in 1977 to study Saturn, Jupiter and their moons. The pair made many discoveries about these far-flung bodies, then checked out Uranus and Neptune and kept on flying. Both spacecraft are now studying the unique conditions at the edge of the solar system, knocking on the door of interstellar space. Voyager 1 — the most distant manmade object ever launched — is currently about 11 billion miles (18 billion km) from Earth, while Voyager 2 is 9 billion miles (15 billion km) from home. NASA has spent about $1 billion on the mission to date.